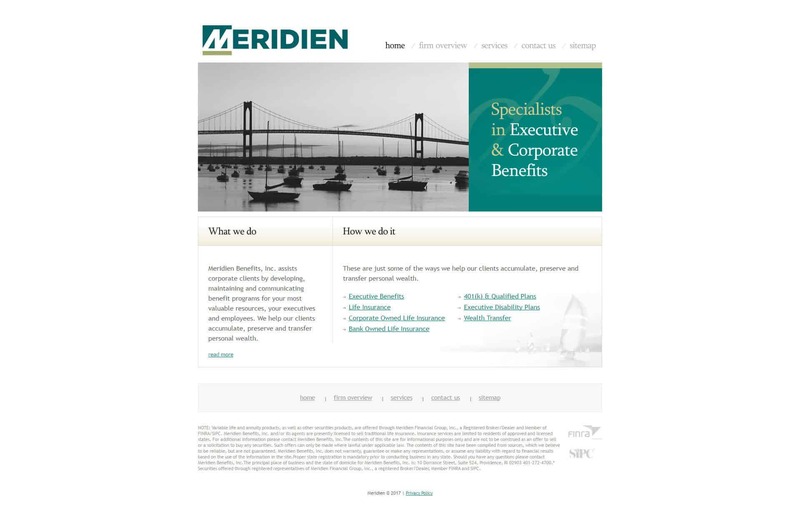 Meridien Benefits assists corporate clients by developing, maintaining and communicating benefit programs for your most valuable resources, your executives and employees. We also help our clients accumulate, preserve and transfer personal wealth. The financial services market is a laggard industry, with some Fortune 500 firms investing heavily into digital, and most small-to-medium sized firms neglecting it entirely. Meridien knew they needed to stand out from the competitors and provide a complete, professional digital presence that accurately represented their unique positioning in the market as a leader in executive & corporate benefits. Bbg worked through three phases with Meridien: Market Intelligence, Strategy & Platform Development, and Execution & Ongoing Improvement. We reviewed competitors, large and small, gathered insights from the collective intelligence of the Meridien team, and devised a plan that would properly transform how Meridien represents itself today. First, Meridien needed to ensure its messaging was uniform, accurate, and powerful. To develop a message that resonates, Bbg conducted over twenty interviews with Meridien’s staff and clients to extract insights about their unique positioning, offerings and brilliance. Additionally, several key competitors were analyzed based on their positioning. The final deliverable included a value proposition document that marketing and sales teams can use to develop powerful and consistent messaging. For a company like Meridien, it is vital that prospective clients are able to learn about the company when they look to conduct research online. Meridien’s former website served its purpose for years as a destination to provide fundamental information about the firm, but lacked the interactivity, professionalism, and educational material that Meridien wished to serve the market with. To redesign the website, we first identified what key information the market wanted to know about. This helped us restructure the site so that important information was prominently displayed and navigation was logical and free-flowing. Then, we went through design iterations, ensuring the layout, style and “feel” of the website met and exceeded the standards and expectations of the Meridien team. In the end, the website needed to serve one purpose, which the design needed to cater to: help prospective clients learn what they need to about Meridien and offer to move the relationship forward beyond the website visit. To empower the digital platform we have created with Meridien, we also helped select, install and setup an email marketing and marketing automation platform. This platform was integrated with the website, providing automated delivery of educational materials and follow-up on prospects who indicate interest in Meridien’s services. Meridien now has the power to communicate one-to-one with as many prospects as needed through this marketing automation tool without the time-intensive personnel hours previously required. To complete the new digital presence, we developed and implemented an SEO plan focused on most relevant keywords to what Meridien provides and what the market is seeking. The complete on-site SEO conducted for the new website increased rankings on relevant searches exponentially, moving some from ranking on pages in the double-digits to page three. This is simply the foundational structure, providing a better user experience with an added benefit of higher rankings. With ongoing SEO services, Meridien can rank on page one for numerous keywords. The original website was just a few years old, but did not accurately represent the talent and culture of Meridien Benefits. The information provided was limited and lacked action-oriented and educational elements. The new website was designed to communicate Meridien’s story and the value they bring to the market. Additional content was created to provide a more informative experience that provides education prospective clients seek. No obligation on either end to work together. Let’s start with an exploratory to see where you are today and where you would like to go. We can connect again immediately after, months later, or never again — whenever the time is right for you to make your next move.